Despite 14 rebounds by freshman Anastasia Dowlen and 7 of 10 free throw shooting by eighth grader Amiyah Collier, the Russellville Lady Panthers' season ended Wednesday at region in a 67-33 loss to defending regional champion Bowling Green High. The Lady Purples are coached by the Lady Panthers' former coach, Calvin Head, who told the media after the game that he expects RHS' young players to mature into a force to be reckoned with in the district and the region. Senior Brooklyn 'Bam' Ray led the Lady Panthers in scoring with 10 points and classmate Jayce Buchner led the team in assists and was second in rebounds. In addition to her 14 rebounds, Dowlen led the team in blocked shots and steals. Collier added 9 points. Chloe Whitescarver hit the only 3-pointer RHS managed in 7 tries. SKYCTC Player of the Game Keyozdon Jones led 11 Lady Purple scorers with 19. BGH improved to 25-7 while Coach Cameron Jackson's Lady Panthers finished 18-12. 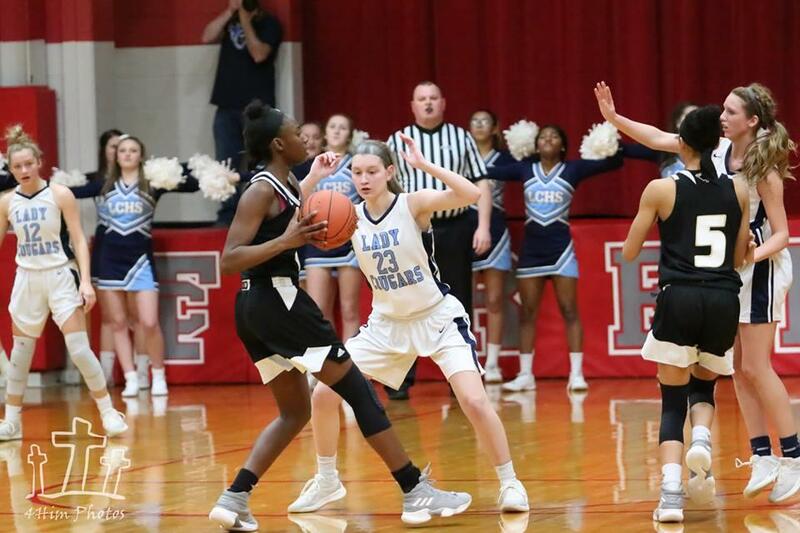 The Logan County Lady Cougars built a double-digit lead against a Metcalfe County team that had beaten them in the regular season and then calmly sank 17 of 21 free throws in the fourth quarter to beat the Lady Hornets 74-60 in their regional opener at Diddle Arena Tuesday. Senior Sarah Beth Hale hit 11 of 12 foul shots in that quarter and finished with 30 points. Center Kennedy Nichols put together a double-double with 15 rebounds and 10 points despite being in foul trouble all night. The Vanzant twins combined for 21 points with Paige getting 11 and Peyton 10. Starter Blayke Bingham hit a big 3-pointer when Metcalfe got close, and Carlie Alvis provided valuable minutes when Paige Vanzant was in foul trouble. Coach Finley Baird’s team outrebounded the Lady Hornets 50-35 with Nichols getting lots of help from starter Halie Borders and reserves Brittany Garrett and Addie White. Logan County advances to next Monday’s regional tournament where Barren County awaits them at 7:45 p.m.
Anthony 'Rooster' Woodard hit a pair of free throws with 1.7 seconds remaining in regulation to send Monday's last regional quarterfinal game into overtime. Then the sophomore hit a sideline jumper with 1.6 seconds left in OT to give the Logan County Cougars a 72-70 win over Metcalfe County at Diddle Arena. The Hornets hit two 3-pointers to break a 30-30 halftime deadlock and never trailed again until 2:32 remained in OT. Woodard finished with 22 points, 10 rebounds and 3 each of assists and steals. Tommy Krohn scored 16, Dalton Thompson 13 and Kelby Epley 11 while Third Bell totaled 8 points, 9 assists and 3 steals. Tyler London scored 28 and Boston Delore 17 for the Hornets. Coach John Tinsley's Cougars will play in the semifinals Friday against Warren Central, which also won in overtime. From Logan County High School Athletic Director Greg Howard: Advance tickets for tonight's boys game at region are sold out. We will be selling girls tickets today and tomorrow during school. No after school sales. Tickets are going fast. Logan County t-shirts are in limited quantities in small, XL, and 2XL. The season came to an end for the Franklin-Simpson Wildcats Sunday with a 57-46 loss to Bowling Green in the Fourth Region Tournament. The Purples will now play Clinton County, which dominated Allen County-Scottsville 73-52. Thirteenth District champion Logan County will play Metcalfe County Monday at 7:45 p.m., following the Glasgow-Warren Central opener. Logan’s game can be heard on WRUS (94.1 FM and 610 AM) along with the station’s website and mobile app. Logan County High School will be selling 4th Region Advance Tickets and t-shirts during the school day Monday in the front lobby. Advance tickets are $6 and t-shirts are $5. The Logan County Cougars (24-6 overall, 14-4 region) have gotten the best draw possible for the Fourth Region Tournament at Diddle Arena. Coach John Tinsley’s team will play 16th District runner-up Metcalfe County (11-20, 4-11) at 7:45 p.m. Monday. Logan’s record is second best in the region behind Bowling Green (24-5). Metcalfe’s is 13th best among the 17 teams. Also in the Cougars’ bracket are Glasgow (21-10, 14-7) and Warren Central (17-11, 10-6). The other three teams besides Logan with the best records (BGH, Clinton County and Allen County-Scottsville) along with Franklin-Simpson are in the upper bracket, which starts Sunday. A win Monday would send the 13th District champion Cougars into a semifinal game next Sunday. Not only did the Logan County Lady Cougars win the program’s fifth 13thDistrict championship in the last six years Friday, but they also avenged the team’s only district loss of the season with a thunderous performance. Coach Finley Baird’s team outscored Russellville 16-4 in the third quarter on the way to a 57-29 win at Todd Central. The Lady Cougars had a balanced attack with five players—Paige Vanzant, Sarah Beth Hale, Peyton Vanzant, Halie Borders and Kennedy Nichols—scoring between 7 and 12 points. Hale and Tournament MVP Paige Vanzant also made the game tough for star Lady Panther 8th grade point guard Amiyah Collier. She hit her only field goal in the final two minutes of the game. Borders got the start for Logan and rewarded her coach with great hustle, rebounding, defense, 8 points and all-tournament honors. Senior Jayce Buchner and sophomore Macaria Hines played solid games for Coach Cameron Jackson’s Lady Panthers. Both teams will learn their regional pairings Saturday morning for Tuesday or Wednesday at Diddle Arena. Russellville four-sport athlete Hunter McDowell will sign today at 2 p.m. at RHS to play football for Campbellsville University. RHS Athletic Director Kyle Yates says: “Hunter McDowell was a two-year starter at RHS. Hunter made 49 extra points and 2 field goals in his career. During Hunter’s time with us he also played baseball, archery and soccer. Hunter was a leading contributor on our All-A Region Championship Soccer Team. During his senior year Hunter had 23 goals and 12 assists on the season. He possesses the confidence that he can achieve anything that he puts his mind to.” He also is a good student and is a member of the Panther Academy, taking college courses at SKYCTC. The seventh sure was the sweetest. Dalton Thompson’s field goal with 4 seconds remaining was the seventh lead change of the 13th District boys championship thriller. It also provided the winning point in the Logan County Cougars’ 67-66 victory over Franklin-Simpson in the tournament title game Thursday at Todd Central. The score had also been tied 12 times. Only once was the margin for either team over four points, and that quickly disappeared. The game winner came on an assist from Tommy Krohn. Tournament MVP Third Bell then played tough defense as time ran out on the Wildcats. Rooster Woodard, Kelby Epley and Bell all finished in double figures. Reggie Powell, the only reserve Coach John Tinsley used, provided a big lift when Woodard got in early foul trouble. Watch The LoJo for more details and for pairings in the 4th Region Tournament, which begins Sunday. The third annual Logan County Cougar Baseball Alumni/Booster Banquet will be held this Saturday, Feb. 23, from 6-9 p.m. Planners say, “Come out to see the exciting things that are happening with Cougar Baseball. This is for everyone that loves the game of baseball.” It will be held at the Logan CTC on U.S. 68-80 in front of the high school. The 1989 state quarterfinalist team will be honored and its coach, David Billingsley, will be the speaker. Current Head Coach Ethan Meguiar, who was a member of that regional championship team, Kentucky 2015 state Player of the Year Caleb Bruner and current Assistant Coach Kyle Wall will also speak. Booster Club President Jon Barrow will provide an update on the progress of the new storage building, which includes a locker room. A meeting of players who are interested in being part of Logan County Middle School Baseball and their parents is scheduled Monday, Feb. 25, at 5:30 p.m. at the 21st century room at LCHS. An up-to-date physical is required for Logan sixth through eighth graders to try out. Tryouts will begin Thursday, Feb. 28, at 5:30 p.m. Those with questions can call coaches Dan McCarthy (314-359-4273), Kyle Pendleton (270-847-9324) or Ethan Meguiar (270-221-5480). A joint memorial service was held Tuesday in Wildwood, Fla., for Larry and Peggy Reeder—long-time Russellville High School teachers who died about three weeks apart in January. Mrs. Reeder’s obituary has previously been reported. Larry Reeder, 80, coached baseball and advised the school newspaper at RHS and was an active member during the earliest years of Russellville Optimist Club. It’s been requested that memorial donations for Larry be made to RHS baseball and for Peggy to the deGraffenried Chorale. Among those attending the services were former RHS basketball coach and major league baseball player Denny Doyle and his wife Martha Carol along with former RHS golf coach Melanie Baker. Nine years of Naylor Basketball came to an end Tuesday. Jacob Naylor, the youngest of three sons of Calvin & Tracy Naylor who have been key parts of Panther roundball teams since November 2010, scored 23 points, but he didn’t have enough help for Coach Rex Booth’s team to advance past Franklin-Simpson in the opening round of the 13th District Tournament. Four scored in double figures for the Wildcats, who won 75-61. Panther Elijah Kemp scored all of his 15 points in the second half, but he and Parker Jones stayed in foul trouble the entire game, with both fouling out. The Panthers cut an 11-point deficit to one at 42-41 when Naylor put back his own rebound and was fouled. RHS was last close at 47-45 on a pair of Naylor free throws. The Panthers finished with an 8-17 record. Franklin will meet Logan County in Thursday’s championship game. Despite having to play without leading scorer Deshala LeBlanc and many key players burdened with four fouls, the Russellville Lady Panthers played gritty, gutty basketball to beat Franklin-Simpson 39-36 in overtime in the first round of the 13th District Tournament Tuesday at Todd Central. Eighth grader Amiyah Collier scored 13 of her game-high 15 points after halftime, including all 5 of the winners’ points in OT. Macaria Hines hit a 3-pointer on an assist from Jayce Buchner with 8 seconds remaining in regulation to give the Lady Panthers a 34-33, but Evyn McCutchen hit a free throw to force overtime. Coach Cameron Jackson’s Lady Panthers move into Friday’s championship game against Logan County. Both will advance to region. 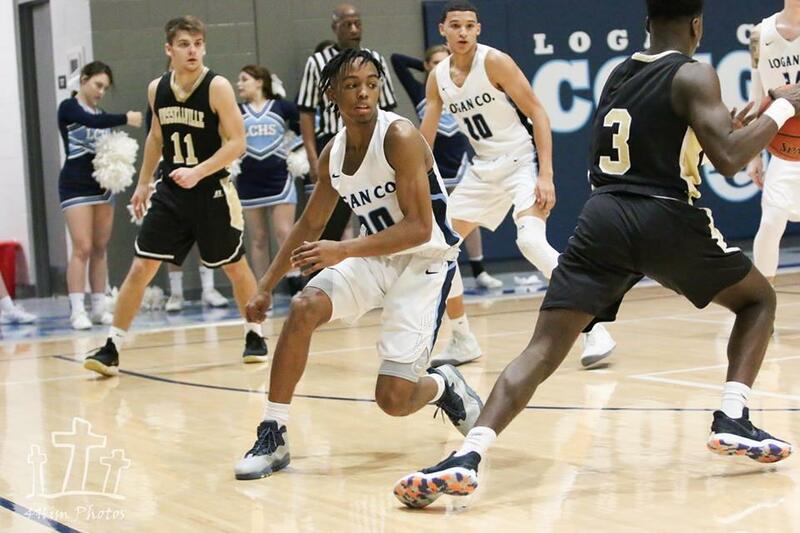 The Logan County Cougars led host Todd Central by 25 points in the first half, saw the margin drop to 12 twice in the fourth quarter, and bounced back for an 82-62 win Monday in the 13th District Tournament. Coach John Tinsley's Cougars await Tuesday's Russellville-Franklin game for an opponent in Thursday's finals. See a previous News Brief on The LoJo for first half details. Austin Rager, Preston Moore & Clayte Weathers led the Rebel comeback. John Calvary finished his Todd career with 19 points and Moore added 13. For the Cougars, sophomore Anthony 'Rooster' Woodard helped in multiple ways, including scoring 23 points. Kelby Epley scored 18, Third Bell 15 and Tommy Krohn 11, Dalton Thompson & Reggie Powell also had solid games in the Cougars' 23rd win. With three Cougars scoring in double figures, the Logan County Cougars led host Todd Central 47-25 at the half of the opening game of the 13th District Tournament Monday. Kelby Epley & Anthony 'Rooster' Woodard each scored 13 points and Tommy Krohn 10 in the first two quarters. The Cougars had led by 25 on Reggie Powell's 15-footer late in the second quarter. With center John Calvary dominating the inside, the Rebels led three times early. The first of Epley's three 3-pointers of the half gave Coach John Tinsley's Cougars the lead for keeps at 9-6. The Rebels' task got much tougher when Calvary drew his second foul with 2:40 remaining in the first quarter. When Calvary came back in midway through the second quarter, Logan was ahead 37-18. Calvary scored 13 points in the first half. The Logan County Lady Cougars are headed to region for the fifth time in Coach Finley Baird's six seasons as head coach of her alma mater. The Lady Cougars beat host Todd Central 72-42 to advance to Friday's championship game against Tuesday's Russellville-Franklin winner. The Lady Cougars led 40-16 at the half. Sarah Beth Hale led a late third-quarter surge, hitting a pair of 3-pointers, firing assists to Carlie Alvis for a 2-pointer and Blayke Bingham for a 3-pointer, and hitting a layup on a long assist from Kennedy Nichols. Halie Borders' goal on a Bingham assist gave the Lady Cougars their first 33-point lead at 56-23 in the third quarter. From then on, the most important thing was keeping any Lady Cougar from getting hurt as the frustrated Lady Rebels went the hard foul route. Hale finished with 18 points and Paige Vanzant 12, as 10 Lady Cougars scored. Amy Brumfield & Emoni Fort finished with 10 points each for Todd Central with Jordan Weathers & Paige Rager adding 6 each. Logan's record improved to 20-10. The Russellville Board of Education's February meeting has been moved from Tuesday night to today at 6 p.m. so that school leaders can join others in supporting the Russellville High School basketball teams in their games against Franklin-Simpson Tuesday in the 13th District Tournament at Elkton. The three seniors on Russellville’s girls basketball team, who have combined for 15 years as Lady Panthers, didn’t get to have a Senior Night Friday because the weather led to Whitesville Trinity not making the trip to RHS. Leading scorer Deshayla LeBlanc has been on the team six years under four different coaches. She has fought injuries the last two years and her availability for next week’s district tournament is very doubtful. Brooklyn ‘Bam’ Ray is a five-year Lady Panther, a hard worker who has earned a place in the starting lineup. Jayce Buchner has been a key player for four years after playing her middle school years at Chandlers. The tall guard can play any position. She also was named MVP of the first Russellville girls soccer team and is a dual credit college student with SKYCTC. Senior Kelby Epley scored 31 points and his team 81 during Logan County's 81-58 Senior Night win over Cumberland County Friday, but Coach John Tinsley was more interested in talking about defense after the game. He said it's the quality defense his team has been playing that needs to carry the Cougars during the post-season, which starts Monday against host Todd Central. Fellow seniors Tommy Krohn, Third Bell & Reggie Powell combined for 23 points while sophomore Rooster Woodard added 15 points and some impressive dunks and assists. Epley scored 8 quick points early in the fourth quarter to reach his point total before giving way to younger players. The Cougars led 75-44 at that juncture. The Cougars finished the regular season with a 22-6 record. Senior Night at Russellville High School didn't happen Friday because of weather concerns for visitor Whitesville Trinity. For the boys, that meant seniors Jacob Naylor, Shawn Steele & Elijah Kemp didn't get their time at center court. Coach Rex Booth wrote: "They are a special group to me because when I came to Russellville, they were freshman so we’ve truly gone through the entire high school experience together, and I have been blessed to coach them over the last two years. All three of these guys are great kids who have been raised the right way by parents who love and support them. Their future is so bright and I can’t wait to see where they end up." The Panthers play Franklin-Simpson in the 13th District Tournament at Todd Central Tuesday. Brittany Garrett took advantage of increased playing time on Senior Night, as she led the Logan County Lady Cougars in scoring on the way to a 73-30 win over Cumberland County Friday. Fellow senior Sarah Beth Hale added 13 while juniors Addie White and Kennedy Nichols each added 11. Senior Carlie Alvis scored 8 points. Fellow seniors Blayke Bingham and Halie Borders joined Garrett and Hale in hitting three-pointers. Paige Vanzant scored 7 and Bingham 6. Coach Finley Baird’s team was so dominant that the Lady Cougars started a running clock midway through the third quarter. Baird has now won 106 games in six seasons as the LCHS bench boss. The Tennessee Valley Authority’s board of directors voted today to shut down the Paradise Steam Plant near Drakesboro in Muhlenberg County, not far from the Logan County line. Among the many who had communicated against the closure have been President Donald Trump and Gov. Matt Bevin. A number of Logan Countians have worked over the years at the plant. According to the Lexington Herald-Leader, TVA opened two coal-burning units on the bank of the Green River at Paradise in the early 1960s, then added the larger Unit 3 in 1970. The plant was once the largest coal-fired facility of its kind in the world, with the capacity to produce enough electricity for 950,000 homes. The utility closed Units 1 and 2 in 2017, in part to meet tougher environmental rules, and built a natural gas-fired plant to replace them. TVA chief Bill Johnson says the move will cut operating costs by about a billion dollars and that the savings will be passed along to rate payers. The Logan County/Russellville Little League will hold its final registration on Friday, Feb. 15, at the Russellville High School Gymnasium from 5:30-8 p.m. The league fee is $50 and is open to boys and girls from ages 9-12. Some 8-year-olds are eligible, depending on their birthday. More information is available on Facebook at Logan County Little League Baseball. Dr. Nick Kafoglis, who represented Logan County in the Kentucky Senate from 1987-99, died Saturday in Connecticut at age 89. The Bowling Green physician was named Outstanding State Senator in 1996. Always a gentleman, he was an effective legislator who played a major role in education reform in Kentucky. He and his wife Pat, who died in 2016, spent a great deal of time in the Land of Logan. They are survived by four children. A public memorial service for Sen. Kafoglis, who was a graduate of Yale University and a U.S. Air Force veteran, will be held at First Christian Church in Bowling Green at 2 p.m. on Saturday, March 16. On Friday, Feb. 22, the Logan Chamber of Commerce will conduct a ribbon cutting during the Grand Opening Celebration of the new Auburn location of Casey’s General Store. It’s located at the intersection of U.S.68-80 and KY 103 near the Dollar General Store. The address is 105 Sugar Maple Drive. The ribbon cutting will be held at 12:30 p.m. The Southern Ky Pastfinders will meet Saturday, Feb. 16, at 7 p.m. at the Logan County Public Library. This month's speaker is Scott Sallee from Greenbrier. Scott is a civil war historian , author, and past contributor to the "Blue and Gray" magazine. His presentation will be entitled "Was Lincoln's War Really Caused By and Fought Over Slavery?" If you are a civil war or Lincoln enthusiast, you won't want to miss this program. The public is invited, and the admission is free, so don't let history be a mystery, come and learn with us. The third annual SKY FAME Family Recruitment Night will be held Tuesday, Feb. 26, at the SKYCTC Franklin-Simpson Center, 175 Davis Drive, Franklin. Door prizes up to $500 in value will be handed out. This is for people who may want to apply to be part of the program, which trains students to be Advanced Manufacturing Technicians while earning an Associates degree, usually in conjunction with working at a manufacturing facility. For more information, contact Kelcie Richart at kelcie.richart@kctcs.edu. The similarities for Russellville's teams were striking Friday night. Both went into games at Todd Central hoping to force tiebreakers in district seedings. Both were without key senior players (Deshala LeBlanc and Elijah Kemp). Both teams got off to good starts. The difference was that the Panthers were able to hang on for the win (71-58) while the Lady Panthers fell 43-34. Jacob Naylor scored 34 points and Jaquis Todd 14 for the RHS boys while Lady Panthers Chloe Whitescarver had 11 after a two-week absence with a concussion. Jayce Buchner added 9. In the girls district tournament, number one Logan County (5-1 district) will play Todd (1-5) and RHS (4-2) will try to make it three wins in a row over Franklin-Simpson (2-4). For the boys, LCHS and Franklin (both 5-1) will flip for first and RHS and Todd (both 1-5) will do the same for third. Big changes in Saturday's Logan County basketball schedule have been announced by Athletic Director Greg Howard. The Lady Cougars' game at Allen County-Scottsville has been canceled. And the Cougars' game time against the Patriots has been moved up to the girls' former spot at 4 p.m.
From LCHS Athletic Director Greg Howard: The Logan County High School Archery Team and parents will be hosting a State Qualifier Bullseye and 3D tournament at the high school this weekend. There are almost 1300 archers registered to shoot. We will be in both the Main Gym and the Aux Gym starting a 5 p.m. on Friday and all day on Saturday. Entrance will be through Aux gym only. We will also have Senior Night in the Aux Gym at 7:45 pm on Friday night. Come out and support the high school team when they shoot at 6 and 7 p.m. and stay to recognize some amazing seniors, Lindsay Allen, Hannah Cron, Mark Lynch, and Maria Bertusi. Check with your local elementary school to see when they will be in action. We have over 200 archers from our county that shoot every weekend. Both swim teams representing the Land of Logan in Friday's Regional Swim Meet at Owensboro Friday spend lots of time together. They share practice and travel time, since both of them are coached by Rachelle Wharton, so it was appropriate that they have a joint pre-regional and Senior Night Thursday. It was held at Lost River Creamery, which is owned by Scott and Angie Harris, the parents of Cougar swimmer Logan Harris. Seniors honored were Katie Ray Holloman of Russellville and Emma Macy, Maria Wells and Alexis Speck of Logan County. From LCHS Athletic Director Greg Howard: Logan County High School is proud to announce, football standout Dontavius Blann will be signing with Lindsey Wilson College. Dontavius will have his signing this Friday at 3:30 p.m. at the CTC. Everyone is invited to come celebrate this special day with Dontavius and his family! Greenwood's Noah Stansbury hit a long 3-pointer as regulation ended, and the Gators got a bucket with five seconds left in overtime to beat the visiting Logan County Cougars 44-43 Tuesday. The Cougars led most of the game but missed some key free throws in OT. Dalton Thompson led Logan with 10 points while Kelby Epley scored 9, Rooster Woodard 7, and Tommy Krohn & Reggie Powell 6 each. Ben Carroll led the winners with 15 points while Jack Roberts had 12 and Brakdon Stinnett 11. Lewisburg youth baseball is taking registrations for summer teams. The remaining signups will be Tuesday, Feb. 5, at Webb’s Restaurant in Lewisburg from 5:30-7:30 p.m.; Saturday, Feb. 9, from 11 a/m.-3 p.m., and Monday, Feb. 11, from 4-8 p.m. The last two are at Mt. Pleasant Baptist Church. Three different age groups are for ages 4-12 and girls are welcome to play. The fee is $45. Logan County 4-H Shadow Riders Horse Club Open Ride Night will be held this evening at 5:30 p.m. at the Logan County Extension Arena. $5 per horse to ride and you don’t have to be a 4-H member. The Auburn Lady Tigers and the Adairville Cardinals are champions of the Logan County Middle School Basketball Tournaments. Both champs broke open close games in the second half. Auburn won over Olmstead and Adairville over Auburn. Watch for more later in The LoJo. Ten spellers at Adairville School have earned the right to compete for a trip to the District Spelling Bee by finishing in the top two in their grade level competition. The Adairville Spelling Bee will be held Monday at 9 a.m. in the school library. The top three will move on to district competition at the Logan County Extension Office on Feb. 12. Playing without long-range shooter Chloe Whitescarver the entire game and leading scorer DeShala LeBlanc the final 10 minutes of the game, the Russellville Lady Panthers held on for a 44-35 win at Franklin-Simpson Friday. With the win, Coach Cameron Jackson's team moved to 4-1 in the district. A win next week at Todd Central would put them into a tie for the number one seed in the district tournament. Macaria Hines hit 3 of 4 free throws in the final minute and Jayce Buchner 2 of 2 in that time frame after both had made steals to seal the win. RHS had led 37-23 with 6:45 remaining in the game, but Coach Lex Lindsey's Lady Cats went on a 12-2 run. A Christina Carver goal with 1:30 remaining cut the lead to four before RHS began hitting free throws. LeBlanc, who reinjured her knee, still was high scorer with 12 points. Anastasia Dowlen recorded a double-double with 10 points and 14 rebounds. Eighth grader Amiyah Collier struggled in the fourth quarter but added 8 points. Russellville is now 16-6 on the season.